An alarm sounds. KING HENRY VI enters alone. This battle fares like to the morning's war, When dying clouds contend with growing light, What time the shepherd, blowing of his nails, Can neither call it perfect day nor night. Now sways it this way, like a mighty sea Forced by the tide to combat with the wind; Now sways it that way, like the selfsame sea Forced to retire by fury of the wind: Sometime the flood prevails, and then the wind; Now one the better, then another best; Both tugging to be victors, breast to breast, Yet neither conqueror nor conquered: So is the equal poise of this fell war. Here on this molehill will I sit me down. To whom God will, there be the victory! For Margaret my queen, and Clifford too, Have chid me from the battle; swearing both They prosper best of all when I am thence. Would I were dead! if God's good will were so; For what is in this world but grief and woe? O God! methinks it were a happy life, To be no better than a homely swain; To sit upon a hill, as I do now, To carve out dials quaintly, point by point, Thereby to see the minutes how they run, How many make the hour full complete; How many hours bring about the day; How many days will finish up the year; How many years a mortal man may live. When this is known, then to divide the times: So many hours must I tend my flock; So many hours must I take my rest; So many hours must I contemplate; So many hours must I sport myself; So many days my ewes have been with young; So many weeks ere the poor fools will ean: So many years ere I shall shear the fleece: So minutes, hours, days, months, and years, Pass'd over to the end they were created, Would bring white hairs unto a quiet grave. Ah, what a life were this! How sweet! How lovely! Gives not the hawthorn-bush a sweeter shade To shepherds looking on their silly sheep, Than doth a rich embroider'd canopy To kings that fear their subjects' treachery? O, yes, it doth; a thousand-fold it doth. And to conclude, the shepherd's homely curds, His cold thin drink out of his leather bottle. His wonted sleep under a fresh tree's shade, All which secure and sweetly he enjoys, Is far beyond a prince's delicates, His viands sparkling in a golden cup, His body couched in a curious bed, When care, mistrust, and treason waits on him. This battle is like the time between early morning and day, when fading clouds fight with the growing light. At such a time, the shepherd, warming his hands by blowing on them, can't call it completely day or night. Now it goes one way, like a powerful sea forced by the tide to fight with the wind. And now it inclines the other way, like that same sea forced to give up fighting because of the wind's intensity. Sometimes the sea wins, sometimes the wind. Now is one the better one, then the other. Both are fighting to be the winner, face to face. Yet neither is winner or loser. And that's how it is with the equal balance of this war. I will sit down here on this molehill. Whoever God wants to win, will win! My queen Margaret, and Clifford too, told me to stay away from the battle. Both said that they fight best when I am not there. I wish I were dead! If only God would allow it, because what's left in this world apart from grief and sorrow? Oh, God! I think life would be happy if we could all be just simple countrymen. We could sit on a hill, like I do now and carve out sundials skillfully, bit by bit, to watch the minutes as they fly by. How many make one hour, how many hours make one day, how many days make one year, how many years a man can live. When we know this, we can then divide the time. I must spend this many hours taking care of the flock. I must spend this many hours thinking. I must spend this many hours enjoying myself. This many days have my sheep been pregnant. This many weeks before they give birth. This many years before I shall shear the sheep's wool. And so minutes, hours, days, months and years, used in the ways they were meant for, would make us white-haired before our peaceful dying day. Ah, what a life that would be! How sweet and how lovely! Doesn't the hawthorn bush give a nicer shade to shepherds looking after their sheep than a richly embroidered canopy in a procession does for kings who are afraid that their people may betray them? Oh, yes, it does! A thousand times nicer! And, in conclusion, the shepherd's homemade cheese, his cold drink out of his leather bottle, his usual sleep under the shade of a fresh tree—all that he enjoys carefree and happy—are far better than luxuries belonging to a prince. Even if his food is sparkling in a golden cup and his body is lying in a fine bed, what is that worth when troubles, mistrust and treason are all around him? An alarm sounds. A son enters who has killed his father, dragging the dead body after him. Ill blows the wind that profits nobody. This man, whom hand to hand I slew in fight, May be possessed with some store of crowns ; And I, that haply take them from him now, May yet ere night yield both my life and them To some man else, as this dead man doth me. Who's this? O God! It is my father's face, Whom in this conflict I unwares have kill'd. O heavy times, begetting such events! From London by the king was I press'd forth; My father, being the Earl of Warwick's man, Came on the part of York, press'd by his master; And I, who at his hands received my life, him Have by my hands of life bereaved him. Pardon me, God, I knew not what I did! And pardon, father, for I knew not thee! My tears shall wipe away these bloody marks; And no more words till they have flow'd their fill. There's nothing good about events that nobody profits from. This man, whom I killed in a hand to hand fight may have some gold coins on his body. I'll take them gladly from him now, but i may lose both my life and these coins to another man before the end of the night just as this man lost them to me. But who is this? Oh, God! It is the face of my father, whom I have killed in this fight, unaware of who he was. Oh, these are sad times when such things can happen! I came from London because the king called us to battle. My father, since he is one of the Earl of Warwick's men, came to fight for York, commanded to do so by his master. And I, who was given my life from his hands, have now taken life from him by my hands. Pardon me, God, I didn't know what I was doing! And forgive me, father, because I didn't know it was you! My tears will wash away these bloody stains and I will speak no more words until my tears have fully flowed. O piteous spectacle! O bloody times! Whiles lions war and battle for their dens, Poor harmless lambs abide their enmity. Weep, wretched man, I'll aid thee tear for tear; And let our hearts and eyes, like civil war, Be blind with tears, and break o'ercharged with grief. Oh, miserable sight! Oh, these are bloody times! While lions fight one another for their dens, poor harmless lambs have to survive their conflict. Weep, miserable man, I'll help you by shedding a tear for each of yours. And let our hearts and eyes be blind with tears, like this civil war itself, until our hearts and eyes break with grief. A father enters who has killed his son, bringing the body with him. Thou that so stoutly hast resisted me, Give me thy gold, if thou hast any gold: For I have bought it with an hundred blows. But let me see: is this our foeman's face? Ah, no, no, no, it is mine only son! Ah, boy, if any life be left in thee, Throw up thine eye! See, see what showers arise, Blown with the windy tempest of my heart, Upon thy wounds, that kill mine eye and heart! O, pity, God, this miserable age! What stratagems, how fell, how butcherly, Erroneous, mutinous and unnatural, This deadly quarrel daily doth beget! O boy, thy father gave thee life too soon, And hath bereft thee of thy life too late! You that have fought me so bravely, give me your gold now, if you have any gold. I have earned it with those hundred times I hit you. 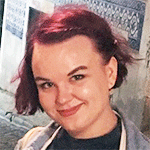 But let me see: is this the face of our enemy? Ah, no, no, no, it's my only son! Ah, boy, if there is any life left in you, open your eyes! Look, look, at these rain showers that fall, blown by the windy tempest inside my heart, on to your wounds, wounds that poison my eye and break my heart! Oh, God, take pity on these miserable times! The deadly fight daily causes these violent actions that are so cruel, so bloody, so wrongful, so rebellious, and so unnatural! Oh, boy, your father brought you into this world too soon and has taken you out of it too early! Woe above woe! Grief more than common grief! O that my death would stay these ruthful deeds! O pity, pity, gentle heaven, pity! The red rose and the white are on his face, The fatal colours of our striving houses: The one his purple blood right well resembles; The other his pale cheeks, methinks, presenteth: Wither one rose, and let the other flourish; If you contend, a thousand lives must wither. Sorrow on top of sorrow! Grief more than the usual grief! Oh, that my death could prevent these lamentable actions! Oh, pity, take pity, gentle heaven, take pity! There's both the red rose and the white rose on his face, the deadly colors of the enemy houses. His purple blood looks like the red rose while it seems to me his pale cheeks look like the white rose. Let one rose fade away and let the other grow strong. If you fight, a thousand lives will be lost. How will my mother for a father's deathTake on with me and ne'er be satisfied! Imagine how my mother will deal with me to learn of my father's death—she'll never be satisfied! How will my wife for slaughter of my sonShed seas of tears and ne'er be satisfied! Imagine how my wife will shed seas worth of tears for the murder of my son—she'll never be satisfied! How will the country for these woeful chancesMisthink the king and not be satisfied! Imagine how the country will think badly of the king after these unfortunate circumstances—they'll never be satisfied! Was ever son so rued a father's death? Has ever a son lamented a father's death so much? Has ever a father so wailed for his son so much? Was ever king so grieved for subjects' woe?Much is your sorrow; mine ten times so much. Has ever a king grieved for his people's sorrows so much? Your sorrow is great, but mine is ten times stronger. I'll take you away from here to somewhere where I can weep until I can weep no more. The son exits with his father's body. These arms of mine shall be thy winding-sheet; My heart, sweet boy, shall be thy sepulchre, For from my heart thine image ne'er shall go; My sighing breast shall be thy funeral bell; And so obsequious will thy father be, Even for the loss of thee, having no more, As Priam was for all his valiant sons. I'll bear thee hence; and let them fight that will, For I have murdered where I should not kill. My arms shall be your burial shroud! My heart, sweet boy, shall be your grave, because your image will never leave it. My sighs will be your funeral bell. And your father will be so dutiful in performing funeral rites for your loss, since I have no more sons, just as Priam observed all the rituals for all of his brave sons. I'll take you away from here. Let others fight if they want to, but I have murdered the very person I should never kill. Father exits with his son's body. Sad-hearted men, much overgone with care,Here sits a king more woeful than you are. Men with sadness in their hearts, overcome with trouble: here sits a king more sorrowful than you are. An alarm sounds. There is fighting across the stage. QUEEN MARGARET, PRINCE EDWARD, and EXETER enter. Fly, father, fly! For all your friends are fled,And Warwick rages like a chafed bull:Away! For death doth hold us in pursuit. Run away, father, run! All your friends have fled and Warwick is raging like an angry bull. Let's go! Death is chasing after us. Mount you, my lord; towards Berwick post amain: Edward and Richard, like a brace of greyhounds Having the fearful flying hare in sight, With fiery eyes sparkling for very wrath, And bloody steel grasp'd in their ireful hands, Are at our backs; and therefore hence amain. Mount your horse, my lord, and ride towards Berwick as fast as you can. Edward and Richard, like a pair of greyhounds who can see the frightened fleeing rabbit in front of them, are right behind us, with fiery eyes sparkling in their blinding anger. They are holding bloody swords in their angry hands. So, let's go quickly! Away! For vengeance comes along with them:Nay, stay not to expostulate, make speed;Or else come after: I'll away before. Let's go! They're coming for vengeance. No, don't stay to debate the matter. Hurry or otherwise follow after us. I'll go away before you. Nay, take me with thee, good sweet Exeter:Not that I fear to stay, but love to goWhither the queen intends. Forward; away! No, take me with you, good, sweet Exeter. It's not that I am afraid to stay, but I want to go wherever my queen is going. Let's go—away! Romancikova, Nina. "Henry VI, Part 3 Translation." LitCharts. LitCharts LLC, 19 May 2017. Web. 20 Apr 2019. Romancikova, Nina. "Henry VI, Part 3 Translation." LitCharts LLC, May 19, 2017. 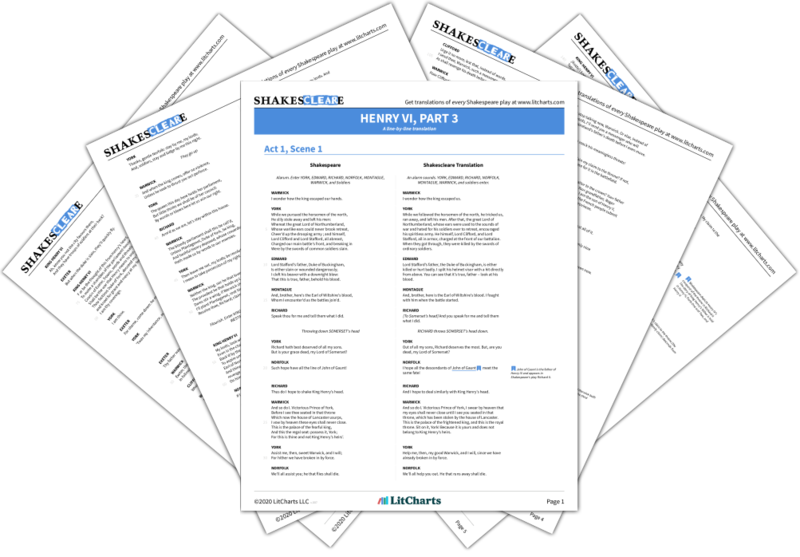 Retrieved April 20, 2019. https://www.litcharts.com/shakescleare/shakespeare-translations/henry-vi-part-3.